Frank Sinatra an addict? So what’s new? 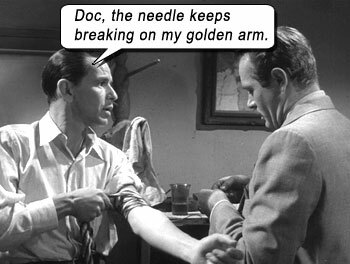 Maybe the real life Sinatra wasn’t on heroin, as depicted in THE MAN WITH THE GOLDEN ARM, but he had his addictive vices. We all know them: booze, broads, bands. But then, everyone commits themselves to something. If you’re going to call commitment or heady enjoyment an addiction, well then everyone’s an addict. And if everyone’s an addict, then no one is an addict. It’s all just part of this condition called Life, innit? From a novel by Nelson Algren, THE MAN WITH THE GOLDEN ARM finds Frank playing ex-junkie Frankie Machine, just released from jail for “dealing,” trying to assimilate back into regular life. Trouble is: he came back to the same town he left. He’s not starting a new life, just returning to the old. Alcoholics Anonymous has a schmancy word for anything that reminds an addict of the desire to lapse back into their addiction: trigger. Well, this whole town is a trigger for Frankie: his crippled wife Zosch (ragged Eleanor Parker) won’t stop shriking, his ex-girlfriend (sultry Kim Novak) won’t stop being hot, his lowlife “business associates” won’t stop bugging him to deal cards, and his pusher (Darren McGavin) won’t stop living just across the street! Understand that Frankie didn’t do time for illegal drugs – everyone calls him “Dealer” because of his “golden arm” at dealing poker games. 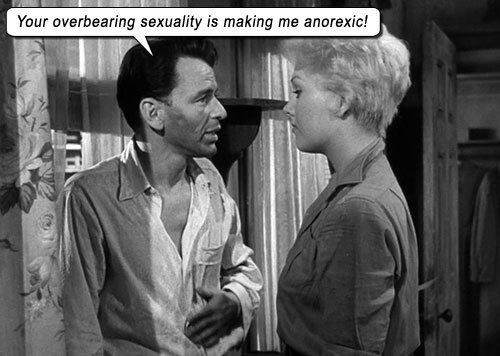 In 1955, it was risqué to broach heroin addiction onscreen, so the filmmakers had to dodge and weave around the story and its theme of relapse. By the way, Frankie’s actual dealer is called Pusher. Filmed entirely on a studio set dressed to look like a town square, director Otto Preminger intentionally made everything across the street from everything else – Frankie’s apartment, the pub, the club, the Pusher – to denote the claustrophobia, the entrapment of addiction… Or maybe it was just cheaper than a location shoot. In its early stages the Elmer Bernstein soundtrack threatens to bludgeon us unconscious, and I don’t know whether it calms down in the latter stages or that we’re just inured to it. More than anyone, Zosch pushes Dealer to Pusher again. He’s trying to hold it together and pretend to love her wheelchaired sweat pimples, in their apartment with the walls the color of dripping grease, and the radio tuned to the All Be-Bop channel, but she won’t stop talking smack, which drives him to smack. Frankie aspires to be a drummer in a big band (that rehearse just across the street – what are the odds?! ), but his relapse would ensure he fails the audition. Performances are robust, except for a few “theatrical” flourishes from Parker and Novak. And weasely Sparrow (Arnold Stang) has been watching too much vaudeville. However, this was the transition era between theatrical and Method (matter of fact, the Eddie Van Halen of Method, Brando, was also up for Sinatra’s role), so we give these transgressions a pass. The film doesn’t go deep enough to actually portray all the unsavory traits of an addict (again, probably due to censors, but also for the marketing angle of not making its star look bad), and Frankie comes off looking like a decent guy by the end. By the time Zosch resorts to extreme measures to hold her man, the film peters out with Frankie’s newfound sobriety portrayed as if it is eternal, rather than an ongoing struggle. Coincidentally, in 1954, that offshoot to Alcoholics Anonymous – Narcotics Anonymous (NA) – had only just been excised from its AA parent and given free reign to fool some of the people all of the time with their phony baloney gravitas. Either because the institution was so new, or because the filmmakers didn’t subscribe to the methods, thankfully, this story treads nowhere near NA. Sinatra once again proves he is more than just a crooner, and would earn a Best Actor Oscar nom for this steely performance. His cold turkey scene is a disturbing unbroken take, as he climbs the dripping grease walls of madness. In Jerry’s Lewis’s 2005 book, Dean and Me, Lewis relates how he and Dean were actually on set watching this performance, and how director Preminger then asked Frank for another take. Frank flatly refused, opining he got it right the first time, and left the set. Lewis goes on to say that when he saw the scene in the final film, it was as powerful as Frank knew it to be. Writers: Walter Newman, Lewis Meltzer, Nelson Algren, Ben Hecht. Starring: Frank Sinatra, Eleanor Parker, Kim Novak, Arnold Stang, Darren McGavin, Robert Strauss.